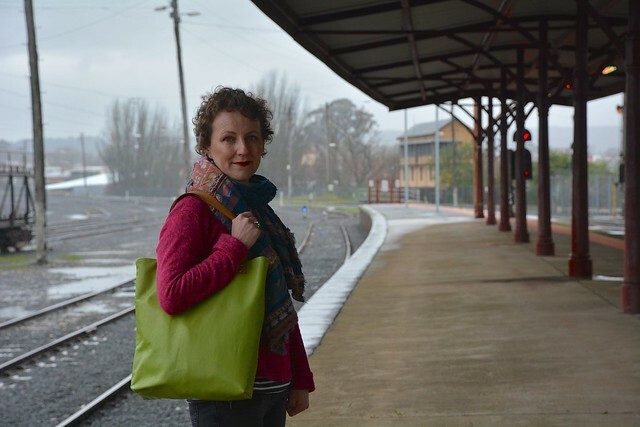 At a studio sale earlier this year I purchased a very soft (and very bright green!) leather hide. Green is my favourite colour, and in my eyes, the brighter the shade, the better! 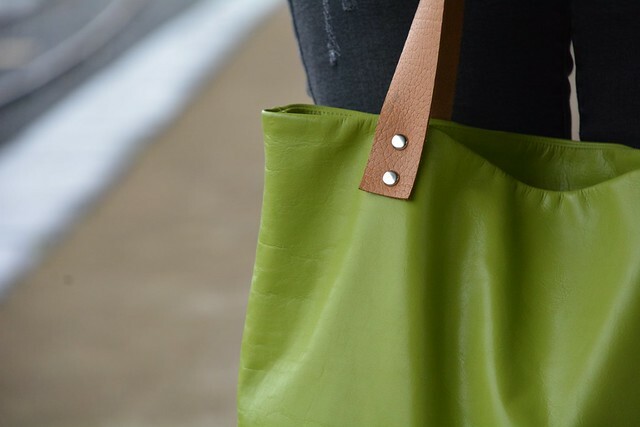 Fast forward to early August when the Genoa Tote (PDF or printed pattern) was in it’s final stages of testing, I decided one Saturday afternoon that it was time for the green leather to be transformed into a tote. Now I have to be honest, I didn’t actually expect this tote to work out. So much so, I didn’t even bother to make the pocket (yes, I’m totally regretting that decision now!) and the only reason there is a key clip is because I had a spare strap which was all sewn and ready to use. Construction was completed on my domestic sewing machine with a leather needle, Gutermann polyester thread (which I use on all my sewing projects) and my ‘regular’ sewing foot. I lengthened my stitch slightly, and in the few places where four layers of leather needed to be sewn, I took my foot off the peddle and hand wound the stitches. It’s not perfect, but it’s passable… and who’s really going to be looking at my under-stitching anyway? I used Clover wonder clips to hold the leather in place before stitching. Pins are a big ‘no no’ when you’re sewing leather as they leave holes that don’t magically disappear with a good steam! Speaking of steam, I will confess to pressing some of my seams…. with a press cloth of course! I’m pretty sure that it’s ‘usual’ practice when working with leather, but this novice was a little desperate to get the leather facing to sit nicely and it worked a treat. If you do want to learn some sewing leather tips from an expert, I can highly recommend You Sew Girl’s blog post on the topic. The softness of the green hide meant it wasn’t appropriate for straps, so I opted to use a thicker hide and I actually love the contrasting colours. These handles are the short and wide pattern piece (54cm x 3cm) and they are ideal for adults who like to carry their bag close to their body or in the crook of their arm. 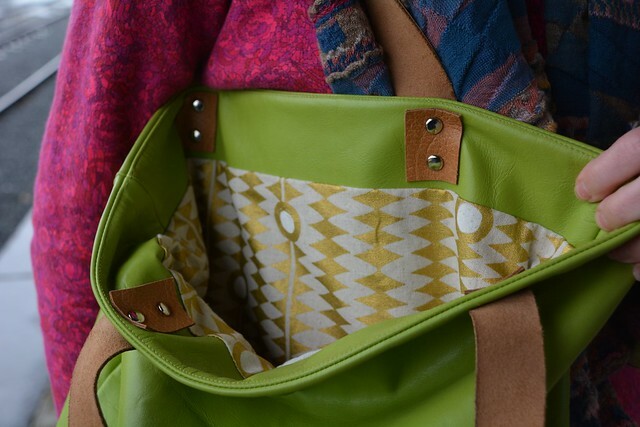 I’m thrilled with my leather tote and it’s been my everyday bag since it was sewn… cough cough…. two and a half months ago. NextHave you seen Karl lately… in Melbourne? 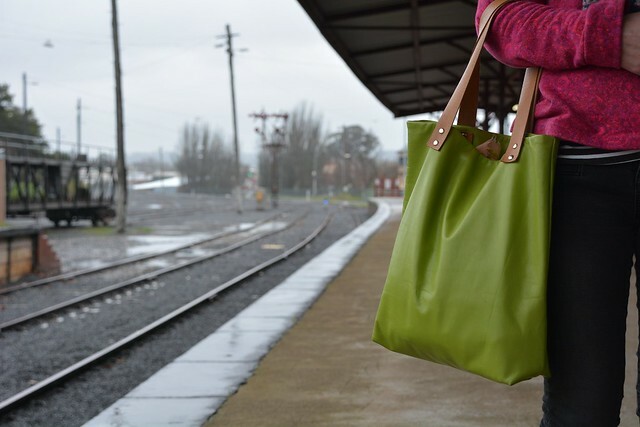 What a gorgeous coloured Tote for what looks like a dismal weather day!! I love the strap length here too! Thanks Rebecca. This is already one of my most worn/used sewn items! Gorgeous of course! Hope my first leather sewing session is as successful! I think part of the key to success is not caring about the outcome…. which is difficult where leather is concerned as there is no unpicking! Love this Anna! And starting to wish I’d taken your class at Craft Sessions! Can you tell me where you bought the leather from? Or any tips on where to buy some in Melbourne? Hi Amanda. I purchased this leather at a studio sale (a one off crafty clearance event). I have brought hides or partial hides before at Lefflers (West Melbourne), NSW Leather Company (Collingwood) and The Fabric Store. The leather for this bag was very thin and soft, the leather required for the handles needs to be around 1.5mm and ideally has some sturdiness. I hope this helps. It fits into my casual wardrobe and style easily. You can’t ask for more than that! 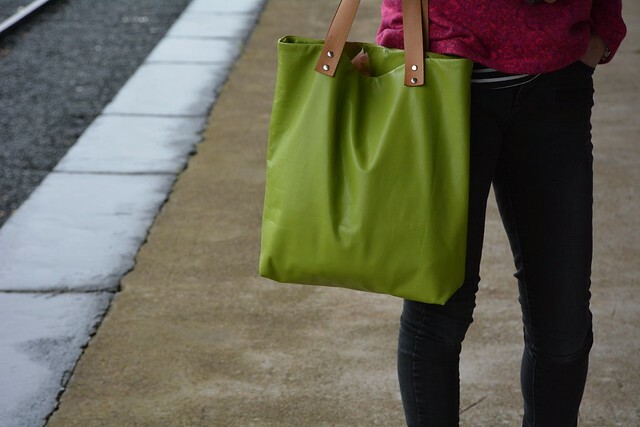 I do feel like a winner everytime I see my green leather tote. Is that weird? It’s really not that bright! A gorgeous green and looks fabulous. 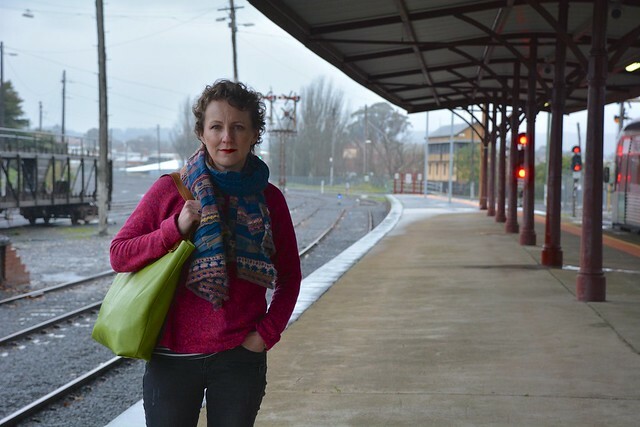 Just bright in the photos on a dreary Ballarat day! Thanks for the catch-up last night. I’ve definitely caught the ‘leather bug’. Anna, this is a lovely tote! You are such an inspiration. Classy and handy. I’m interested in the studs that you used to attach the handle. Love this Anna, Green and green blue hues are my favourite too. Leather is not for me (veggie) but I can see the beauty in this.